Latin is a really fun musical style to play on guitar. 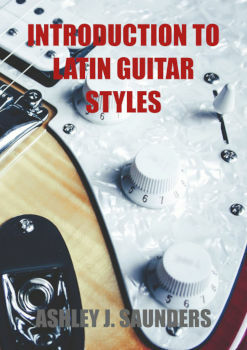 Introduction to Latin Guitar Styles eBook will teach you the clave which is the foundation of Latin music, a few different styles, common guitar chords and so much more. So, if you're looking to explore a few different musical styles, this is the eBook for you. Latin music contains many musical styles and all are really fun to play, especially on guitar! Plus learning the basics of a few major styles is a great way to add something new to your guitar playing! While typically a nylon strung guitar is used, you can learn on any guitar. And when you get to play a guitar with nylon strings, you'll sound even more authentic! 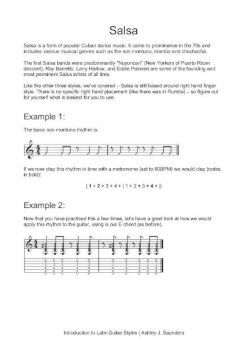 Firstly, in the Introduction to Latin Guitar Styles eBook, we'll look at the clave. This is the foundation of Latin music and therefore should be understood and mastered before trying individual styles. Next, we will explore four key styles: Samba, Bossa Nova, Rumba and Salsa. For each, we'll learn a bit about the history of the style, the main components on guitar as well as some examples of the common patterns used. This ebook, while highly educational, was a lot of fun to write and should provide you with hours of enjoyment! 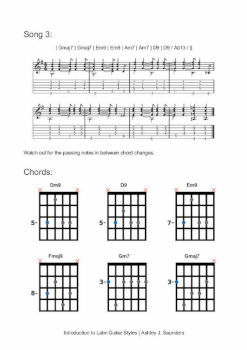 Challenge your rhythm guitar playing! 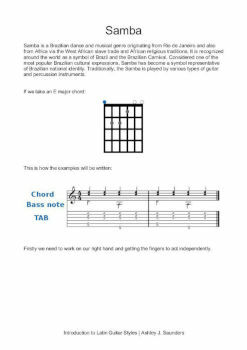 This eBook is aimed at those want to learn to play the Clave right. So, get in the Bossa Nova groove!